The Austin Convention Center is the main hub of the South by Southwest conference. It is located in the heart of downtown Austin and is the location of the main registration area and many of the keynote sessions. The trade show is a multi-day exhibition in the Austin Convention Center that highlights technological innovations from around the world. It is also SXSW's #1 source of free writing utensils. This device applies stimulus to the throat in order to simulate the experience of stuttering. It allows the wearer to experience a new level of empathy for people who experience stuttering in their daily life. Sensiks introduces a sensory reality pod that provides an immersive VR experience. According to the founder, Fred Galstaun, it was inspired in part by the concept of simulating a dreamlike state. The immersive Sensiks experience includes visuals from an Oculus, heat, smell, and sound. It is being tested for use in therapy for dementia and PTSD with more possibilities in the future. You can use an app to send a "hug" to someone with a Parihug huggable plushie. The hug feels like a soothing vibration and is sent in real time. The Parihug is machine washable if you remove the electronics. If you don't remove the electronics then you might have an issue. This device is wearable technology for personal safety. It's a small, discreet, button that can be tapped to create an alarm or to send automated "distress" texts. There are many possible applications from subtly calling for help, to subtly requesting an "escape this date" call. This organization uses donated flash drives to share TV shows and other media with people in North Korea. They are smuggled in to spread information from the outside world and to subvert the restrictive regime. Apparently it's mostly culture from South Korea, but the Hunger Games were also very popular. Paper-thin biometric sensors that collect data and are worn like a stick-on tattoo. They can be used for biometric monitoring, human-computer interfacing, or as an edgy fashion statement. Swimlap is a wearable device that attached to swim goggles. It pairs with an app and allows users to track how many laps they swam. This booth at the trade show used HTC Vive technology to give users the experience of virtually shopping at a store in a virtual reality experience. The Heart Simulation Viewer allows uses put on a pair of glasses and see a virtual heart floating before their eyes. There is a stylus that can be used to manipulate the heart and study its anatomy in detail. Shisheido partnered with Microsoft to make an app called "TeleBeauty." The app applies digital makeup to the users during a video conference call. This company makes a 3D printer designed for use in classrooms. The shape and design make it more durable so the prints don't get ruined and make it harder for people to accidentally burn themselves around the heated areas. This company makes kits that motivate kids to learn. One of the kits is "the world's first programmable and educational drone." The Levi's popup event includes a variety of Levi's products including wearable technology in the form of a denim jacket made with the help of Google. By touching the sleeve you can shuffle through music on your phone. This pop-up activation for Animal Kingdom on TNT has a station with customized Vans shoes for contest winners. It takes place in a parking lot across the street from the towering Frost Building. Amazon Video rented out a bar on 4th street to promote their original content. People scan a bracelet at different stations then provided information about their digital viewing habits in exchange for free drinks and swag. A giant white buffalo statue with glowing red eyes stands over a (presumably fake) pile of human skulls. A real white buffalo was born in Texas in 2011. It was a sacred symbol to many, but it died mysteriously. This statue is here to promote a new TV show called American Gods. The Carvana vending machine records uses "shaking" two handles on the vending machine. The users see a funny video of them making silly faces and then they get a toy car. The Japan House features an art installation called "Hello Synchronicity." Users press on screens on the wall and the projected visions shift in response. They smile and stare in wonder. Texas A&M has an art exhibit at Hotel Van Zandt to show how their students mix art and technology to make these interesting forms and images. There are 3D printed figures as well as digital drawings and other mediums. NASA let people try out the experience of their high performance EVA gloves that will be added to an advanced space suit. Lockheed Martin is a contractor that partners with NASA and they will be helping build the Orion Multi-Purpose Crew Vehicle for deep space exploration (ultimately leading to Mars). This simulator gives visitors a taste of what it might be like to fly a spacecraft. This is a 1/10th scale model of the Cassini Spacecraft. Cassini is designed to study and collect data about Saturn. 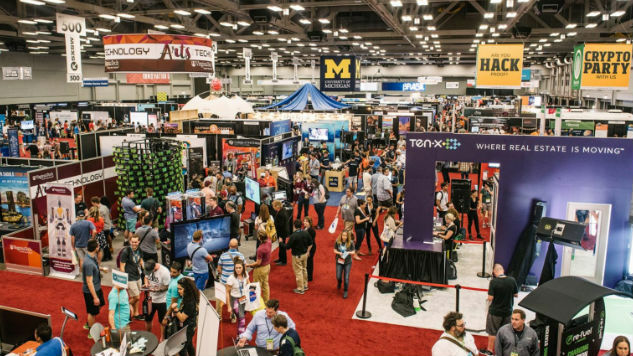 SXSW is a more integrated festival than ever. There’s still music, film, and interactive mediums present, but technology really is the thread that connects them all. Present at the week of events are all sorts of different startup tech companies, each attempting to get their new gadgets, apps, and experimental technology in front of people. We made our way through the festival to see the most interesting, provocative, and downright strange technology—and took some photos along the way.